The start-up voltage was higher today (10.35 volts) than it was yesterday (9.65 volts). That may point to the batteries being a little more discharged than I thought, coming out of the shipping box. They’re supposedly shipped at 100 percent, and have 85 percent if used within two years. If they were a little lower coming out of the box (stored on a shelf too long), then I’m looking at an even better runtime on these freshly charged batteries. Vaguely, this makes sense, because of the efficiency difference between the booster and the DC-DC converter, I was indeed expecting a better runtime than four hours yesterday. So, time will tell. Literally. After all the smoke has cleared, maybe we can define a couple scenarios where we might use NiMH batteries effectively. In one scenario, we’re using a small number of C cells (3) driving a booster board, and a low current-draw headless Odroid computer, in a NAS or stand alone LCD-less server configuration. In this low voltage configuration, we have to make sure the booster efficiency is high enough and the battery current draw is low enough to suit us. In the other scenario, we’re using a larger number of cells, and lowering the voltage with a DC-DC converter, such that the battery current is kept within reason, and we’re able to run the entire tablet computer (both the C1 and the LCD) for a pretty long time. We’ve decided that the latter, high-to-low voltage, DC-DC converter approach is more efficient, at least for the particular boards we’ve used for comparison. I’ll use eight C cells, and rearrange the boards so that I can tuck the batteries into the tablet. With eight cells, both the batteries and the converter board ran “cool as a cucumber” – and that’s nice. The low voltage approach has a nice small form factor. BUT – the batteries obviously have to work harder. So, depending on current draw (in other words, whether the LCD is being used or not) – one technique may be preferable over the other. If there are very many USB devices attached to the droid and that add current consumption, then that in itself may make the booster approach infeasible. Because I’d prefer to have a heat sink on the board (the booster didn’t have one), and want to run conservatively to minimize energy loss, I think I’ll choose the high voltage approach even when running only the Odroid by itself. Not all booster and converter boards have the same efficiency. They have to be individually tested under the use-case conditions. The particular DC-DC converter I chose had good efficiency (97 percent in the 8 cell configuration). Converter efficiency is current dependent. I’ll be using it with the eight cell lineup, to keep the current tamped down a little more. I’d rather not have the amp of battery current that six cells would have given me. The batteries might not run as cool in a six cell configuration. I haven’t tried it. I know the eight cell configuration runs nice and cool for me. There’s no noticeable heat at all, when I touch the batteries or the converter heat sink fins. Note: the stress on a battery is dependent on its load. So – all of these battery scenarios assume that the load is only the Odroid, or the Odroid in combination with the LCD (depending on the particular configuration. 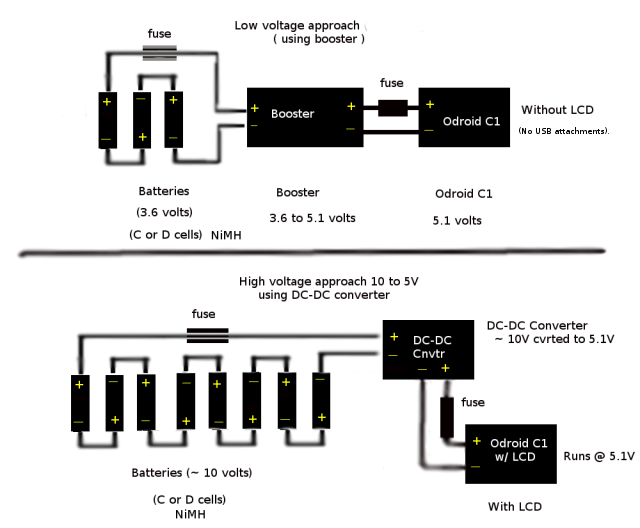 Only the “high voltage” DC-DC converter (not booster) configurations are used with the LCD included). The booster board was not entirely to blame for the poor efficiency (55% and 85%) relative to the first (low voltage) scenarios we tried. We had put together a use-case with parameters close to the edge of the design (3.6 volts versus the booster low range limit of 3.0 volts) and a small number of cells from which to extract the energy (hence, higher battery current). However; with some adjustment in terms of applicable use-case, paying attention to efficiency and current draw, the small form factor could be a good thing. Now that we know the edge cases for our battery, we’ve decided to go with the higher voltage setup, and have implemented something. Are we happy with it? I am. I like the idea that I can swap in a replacement battery any time, that they’re common and easy to get. I have used very premium batteries in my experiments, just to exclude the poor ones as a reason for any problems. I think that somewhat less premium batteries may provide almost as good a result, and might make the battery price-efficient as well. Admittedly, its cost is probably higher than LiPo with the premium Imedions in the lineup. But initial cost is different than lifetime cost. The Imedions will recharge 1000+ times. The LiPos would get nowhere near that. Once the recharge count parameter is taken into consideration, we are ahead of the game. A premium charger should also be considered. So, how did we do on the second run, from fresh batteries? I am now the proud owner of five and a half hours of run time. With a long lunch, I have my work day covered now! The main thing we’ve found is that we needed to find conversion boards, whether they be booster type boards or DC-DC (down voltage) converter boards, that are efficient for the use case we’re dealing with. In my first case scenario, the (poor) 55% efficiency of the booster board motivated me to switch to a DC-DC high-to-low converter with 97% efficiency. All of the power associated with the inefficiency of a booster or converter is wasted as heat. None of it gives me any runtime whatsoever. Heat stresses boards and batteries. So – the rule of thumb is to keep a close eye on efficiency. We’d like to have it as high as we can get it. I’m happy with 97%. Very happy. Not all booster and converter boards are created equal. They have to each be tested for efficiency, while operating under the parameters of our circumstances. If the absolute value of the current needed by a project is low, then the efficiency is somewhat less critical. Nonetheless, it should be checked and evaluated for every circumstance.